• cut out and set aside the 5 inch skinny piece for later. • on the three 8 1/2 long pieces measure and mark a line 3 inches from the ends of on both sides of all the pieces. • now measure and mark in 1/4 increments across the boxes drawn on either sides, these will be the fringy part of the tassel. • cut along the drawn lines to cut the pieces apart and create the fringe. • stack the 2 thinner pieces on top of each other and then in the middle of the largest leather piece. 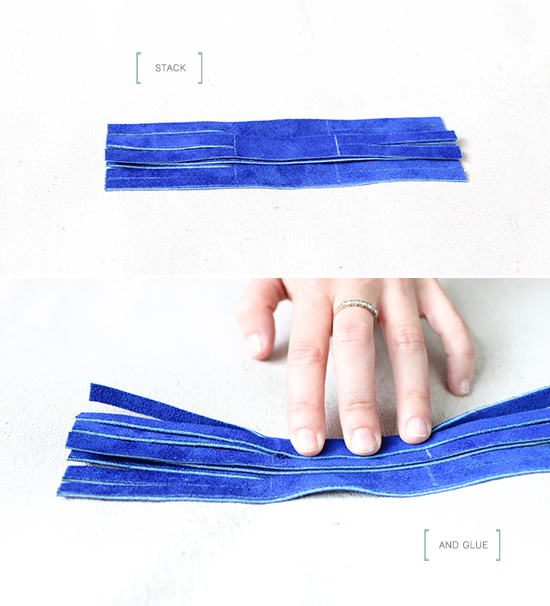 • carefully fold one side over the other and secure with a nice, neat line of glue. • clip and let dry. • find your skinny piece that you had set aside and glue it across the fold, right where the fringe and solid part of the leather meet. let dry. • slip the leather through the split ring. • drop a little dab of glue just above the skinny piece fold in half and hold together so that the glue begins to grip. 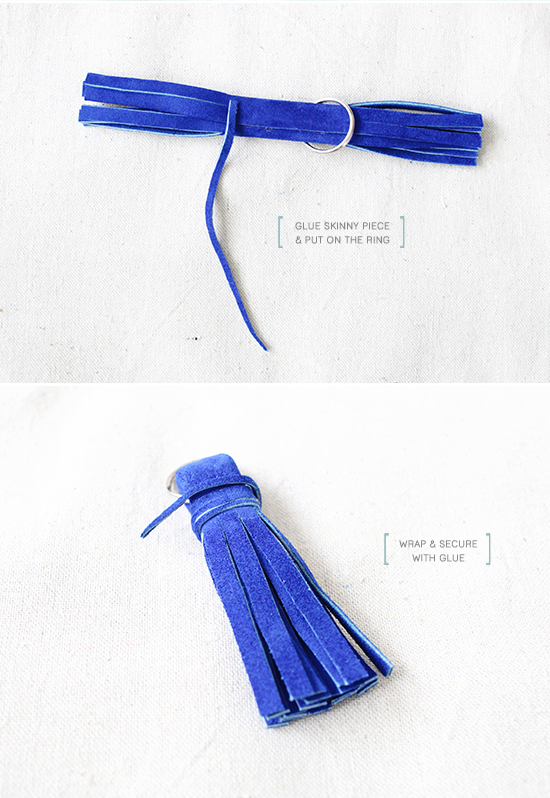 • lastly, wrap the skinny piece around the whole tassel and secure with glue. What a great craft! Can’t wait to try it out! Making these this weekend! Perfect idea for little Christmas gifts! This is a super cute idea, I’ll definitely be trying it out. Hopefully, it looks as good as yours! Love the colors you used too. I always love seeing what you come up with. You’re so creative! I love those blues! I will definitely have to try this out, so cute to attach to a zipper too! Love this DIY, seems so simple and they’re so incredibly useful! LOVE these! I think I’m making a few for me too! What a perfect keychain! My fiance thinks I’m nuts because I only carry my keys one at a time: Car and House. It’s pretty ridiculous, and I do lose them ALL the time. Maybe this will inspire me to make a keychain! this is adorable. great diy, and perfect for gifts, of course! Love this – I have been eyeing one of these to buy, now I can just make it! i love those! they are adorable and look super easy to make…the perfect gift. Ahh! so cute. I’ll have to make one soon! 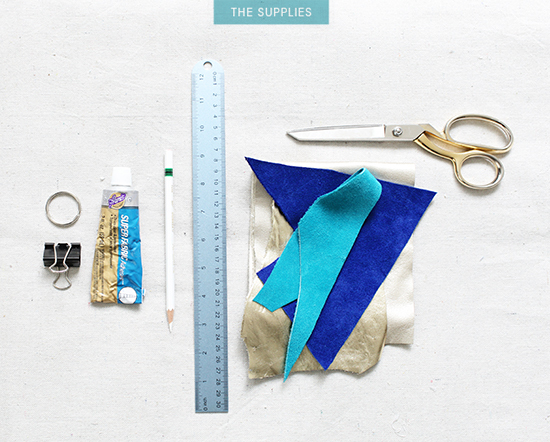 Love this AND the preceding clutch DIY! I need a new keychain and I’ve been trying to find an inexpensive one. I can’t beat a free version so I’m definitely making one of these! wauw that looks really great, love it! where do you suggest getting leather from? love this! 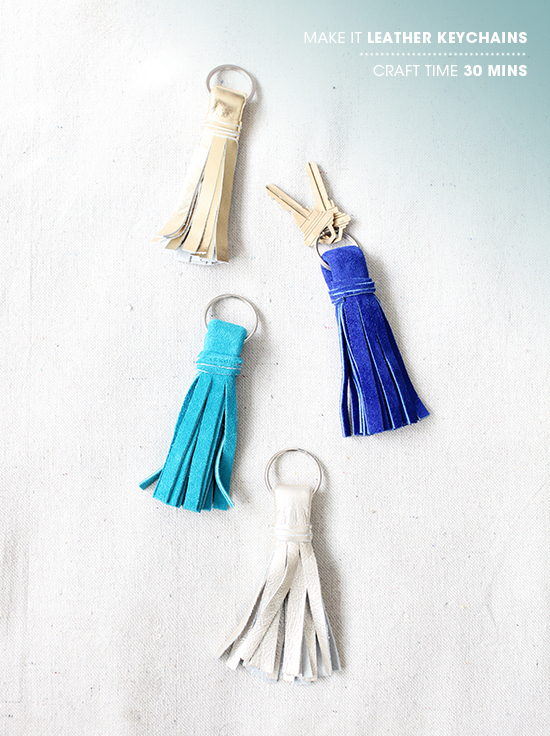 Tassels are one of my favorite things. Thanks for sharing. Definitely pinning this to keep for the future! Pingback: Polly's Picks: 45 BEST Weekend Lifestyle DIY Tutorials EVER - Mrs. Polly Rogers | Decorate, Make, Create! | Mrs. Polly Rogers | Decorate, Make, Create! so much approximately this, such as you wrote the book in it or something. hi! love this DIY project! where did you purchase your leather from? was it local or online? I have an old leather fanny pack that I’ve been looking around for a way to remake it into something else. This is a fabulous idea that I’ll definately be trying out. I have got browse through great number of personal blogs together with completed many websites,but your work is without a doubt magnificent.Hats off for your personal persistence . and honesty.Do retain us all stated to in future as well. Appreciating the time and energy you put into your blog and in depth informatin you provide. I thought I’d have to read a book for a direovcsy like this!